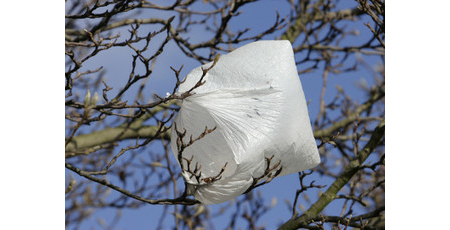 Plastic bags cause damage to ocean marine life, street litter, and carbon emissions in their manufacture and shipping. As Americans we use 102 billion grocery bags a year. They're a product with a useful life measured in hours and a waste life measured in centuries. Get the quick facts on plastic or read the Greenpleace report Plastic Debris in the World's Oceans [PDF] for a more complete understanding. The debris that marine life consumes or that entangles them could well be a plastic shopping bag. Maybe one of ours. Maybe one of yours. Take a moment to think about that. You'll never look at a one-use plastic bag from the grocery store the same way again. This is something we can do. Plastic bag bans are spreading across the country. The city of Rye, New York just passed a ban. If Rye can do it, New York City can do it. By banning the bag, New York City can send a powerful signal that this great city can be an environmental leader. Please sign the petition to encourage the City Council to take up this issue again. And please share it with every New Yorker, and everyone who cares about the environment, that you know.